Hi Guys! Another day on the healthy Summer kick! While I know that it is so super hot out (I am melting in New York- literally), this soup will be worth turning your stove on. I made it myself in the Seattle Heat wave (that is lasting like a month!) a little over a week ago. Because we planted a vegetable garden this year, I have so many veggies, and I have been scrambling to find ways to use them all up. Turns out this soup was a delicious way to do that, and happily it provided me with super healthy and tasty meals for part of the week. We had it for dinner one night with this green salad and then I basically ate it for lunch every day until it was gone. The wonderful smoky spices and fresh vegetables pair perfectly with the chicken and it’s all topped off by a spicy bright cilantro sauce that will knock your socks off! I like to garnish with some creamy avocado and an extra squeeze of lime- but however you do (or don’t) it will be delicious! In a large pot over medium heat add the olive oil and onion and sweat until soft and translucent, about 5 minutes. Add the garlic and spices and stir, cooking another 2-3 minutes. Add the tomato sauce and stir for another minute. Remove the pot from the heat and then transfer the contents into the jar of a blender. Puree on high and then set aside. In the pot over medium heat, add 2 tablespoons of olive oil and then add the carrots and celery, cook for another 5 minutes, stirring often. Add the zucchini and summer squash and corn and cook another 2 minutes. Add the chopped chicken and then pour in the tomato sauce combination. Add the Organic Pacific Chicken Broth and stir to combine everything. Put a lid on the pot and turn the heat to low. Simmer for 30 minutes with the lid on and then remove and cook another 15 minutes. Season to taste with kosher salt. While the soup is simmering, make the Spicy Cilantro Sauce. For the Sauce, combine the garlic, jalapeno, green onion and fresh cilantro along with the lime juice and olive oil. Puree until you have a smooth sauce. Season to taste with kosher salt. 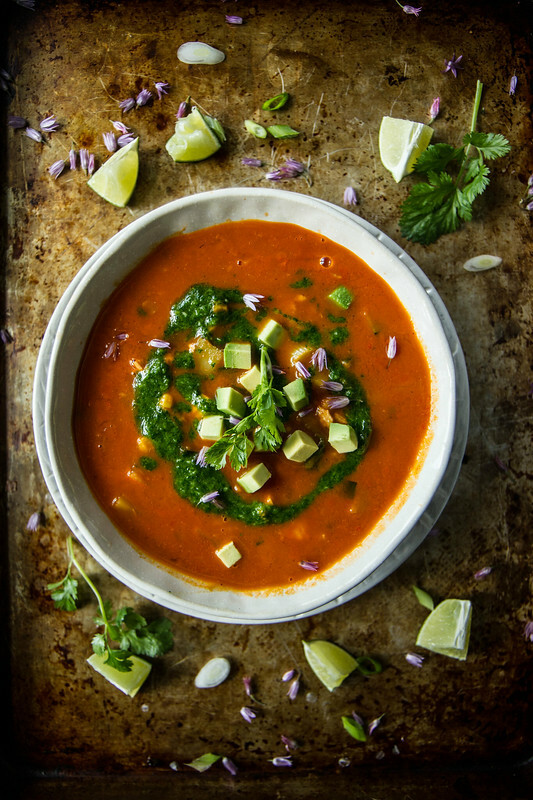 Serve up a generous bowl of the soup and then drizzle with the spicy cilantro sauce. Garnish with avocado, green onions, fresh cilantro and lime wedges of desired. Step 3 Sweat onions and carrots? thank you Jay- I corrected the typo! Do you split the chopped onion and use half for step 2 and half for step 3? Or should there be another chopped onion in the recipe list above chopped carrot? Oh thanks, I see it has been corrected! This soup looks fantastic. What a perfect summertime soup, I can not wait to make this. Thank you!! I love the bounty your garden is pushing out, since we all get to enjoy in small ways like this post – LOVE the recipe! And Pacific Organic Chicken Broth is the best! What a fabulous soup!! Love!! The spicy cilantro sauce sounds soon intriguing!! Great soup! Amazing!!! Fresh vegetables are the best!! 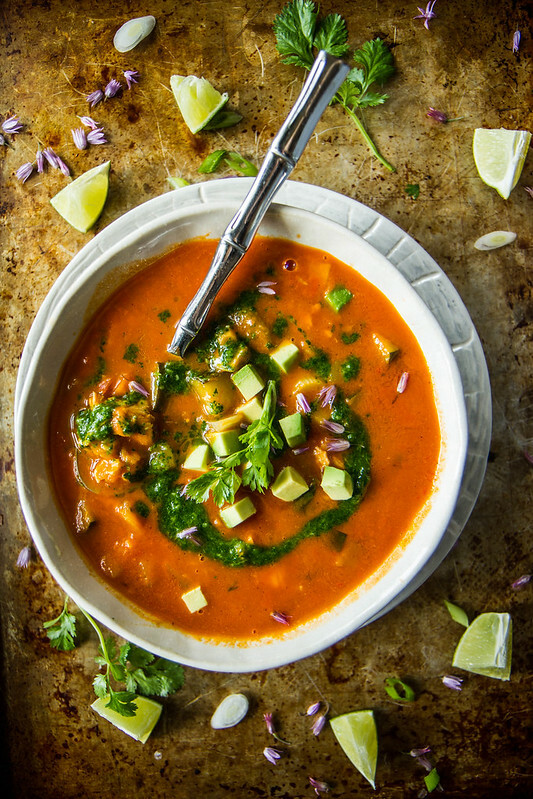 July 10, 2015 at 3:16 pm	 Sandra T.
I love that spicy cilantro sauce, what a great looking soup! The color of this is so pretty! And I ate soup last night, even though it’s 90 degrees here. So I’m down with soup in the summer. Especially with lots of summery garden veggies tossed in! I am SO SO SO making this yesterday. I made this for the week and man it is good! I twist different then chili but really earthy and warming. Will definitely make again.